WHAT MAKES A GAME iconic? It’s a question The Strong, a museum of play based in the US, has been trying to answer since 2015 as it chooses a select few for its hall of fame. Before one can be selected, a game must meet four conditions: it must be iconic (is it widely recognised and remembered), it must have enjoyed popularity over time, it must have an international reach and it must have a significance influence on gaming and popular culture as a whole. So far, only 12 titles are in the gaming hall of fame with the most recent entry released in 2004. Here they are. Why it was chosen: For being the longest published and most successful education game of all time. A game that may be more familiar thanks to the game over phrase “You have died of dysentery” among other things, The Oregon Trail was originally created in 1971 by a teacher as a way to teach students history, but it was 1978 when it was redesigned and released on the Apple II. It sold 65 million copies and while its purpose was educational, it was tough to ensure as many of your family members survived. Why it was chosen: For launching the video game industry. An incredibly simple concept that was built as a training exercise, Pong was one of the earliest arcade games released and one of the first to achieve mainstream popularity. There was nothing complicated about it, but that and small touches like the ability to angle your shots made it a competitive game for all involved. Why it was chosen: For catapulting video games into the mainstream and proving they weren’t a fad. 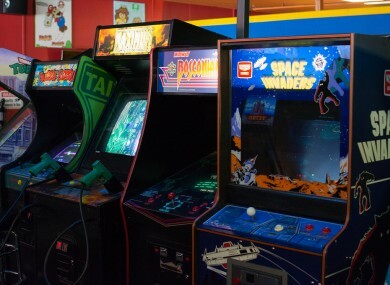 Space Invaders was one of the earliest shooting games and also happened to be the game that helped turned video games from a novelty into a global industry. It also popularised a number of different tropes associated with games including high scores, enemies that shot back, a continuous soundtrack, a lives system and moved gaming away the usual sports recreations to more fantastical settings. Why it was chosen: For making games a mass cultural phenomenon thanks to an iconic character. One simple character, four ghosts, and an endless maze full of dots. Yet Pac-Man was so much more. He was one of the first iconic characters in gaming but also gave his four antagonists (Blinky, Pinky, Inky, and Clyde) unique personalities and cut-scenes to break up levels. Why it was chosen: For being a timeless game that has mass appeal across the globe. Created by the Russian designer Alexey Pajitnov, Tetris featured on PCs and arcade cabinets but it was before Nintendo’s handheld, but it was really the Game Boy that catapulted it into popular culture. A launch title for the popular handheld, the simple yet addictive mechanics and theme tune that stayed in your head long after you’ve played were instrumental in its success. Why it was chosen: For being instantly recognisable and kickstarting the most popular gaming franchise of all time. It’s hard to talk about influential video games without mentioning Shigeru Miyamoto’s iconic series. Donkey Kong may have marked the beginning for Mario, but Super Mario Bros not only cemented his status, but turned the NES into a must-have console and helped revive the gaming industry after the crash of the 80s. The first stage alone is a textbook example of how to create an opening stage and even to this day, its influence can still be felt. Why it was chosen: For popularising non-linear, open world exploration games. Inspired by Miyamoto exploring the countryside as a child, The Legend of Zelda presented a large, complex overworld that was begging to be explored. A world full of secrets, challenges and the fact you could tackle the dungeons in any order gave the player significant freedom, something not seen that often in console games. Why it was chosen: For propelling SEGA ahead of Nintendo (temporarily) during the 90s console wars. Back in the early 90s, Sega held a competition to design a rival mascot to Nintendo’s Mario. The answer was Sonic and what happened was usually referred to the golden age of gaming. With the first adventure coming out in 1991, Sega had developed an icon that was everything Mario wasn’t: speed, attitude and a fresh design (the setting of Green Hill Zone quickly became the template for many opening stages) gave SEGA a memorable character to spearhead its attack on Nintendo. Why it was chosen: For shaping the course of gaming history. Revolutionary for how it characterised the first-person shooter, it’s easy to dismiss Doom as twitch gaming at its most pure but that would do it a disservice. Sure, that played a major part but it was also a very disciplined game. One where knowing all the secrets, pickups and enemies was essential if you were to make it through alive. On harder difficulties, it could feel like a case of trial and error but it was rarely unfair. The game always gave you the tools to get through each level, you just had to make good use of them and your skills. Why it was chosen: For expanding the notion of what a game could be. Practically a virtual doll house where you could play out the lives of some unsuspecting people, The Sims was the soap opera we all dreamt of. Sure you could work towards making your Sims happy but for some, the real joy was thinking up twisted, unimaginable ways to be cruel to them. The kind of actions that would get you arrested or at least leave family and friends concerned for your wellbeing. Why it was chosen: For both its open-world structure and its mature content which made the series infamous. By this point, the Grand Theft Auto series had developed a reputation for controversy, which in no part helped its status but adding a third-dimension (the first two were top-down affairs) gave it a freedom rarely offered by games at the time. It wasn’t just the missions or the violence, but the sheer freedom offered to you. You could go almost anywhere and just explore the city without worrying about missions, an aspect that became just as big a part of the series as the controversial elements. Why it was chosen: For reshaping the way people think about their online lives and communities. Any game that South Park dedicate an entire episode to automatically makes something recognisable but World of Warcraft reputation is well deserved. Taking place in the world of Azeroth, the level of customisation players had was (at the time) huge and the ability to interact and complete quests with groups of people helped its popularity. During its lifetime, more than 100 million different accounts were created for it with activity still but subscribers have fallen to 5.5 million, compared to a peak of 12 million in 2010. Email “These are the 12 games chosen for the world hall of fame ”. Feedback on “These are the 12 games chosen for the world hall of fame ”.